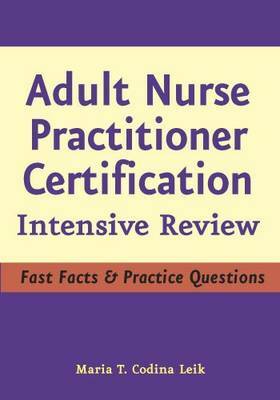 Suitable for RNs preparing to take the NP examination for certification as an Adult Nurse Practitioner, these review books provide an upper hand to passing and excelling on the exam. Unlike other certification reviews, this book provides a special "question dissection" section of sample questions and test tips that help reduce test anxiety by preparing students for commonly seen questions and teach a critical thinking approach to answers. Special features include: overview of normal findings in physical assessment by organ systems in outline format; succinct review of diseases seen in primary care in outline format; and, "Question dissection" chapter with specific test-taking tips for the exam.